Happy Halloween! While I’m not the biggest fan of dressing up and going out trick-or-treating (maybe because I grew up in BFE where trick-or-treating was having your mom drive you to your neighbors house miles away) I still have a little holiday spirit. 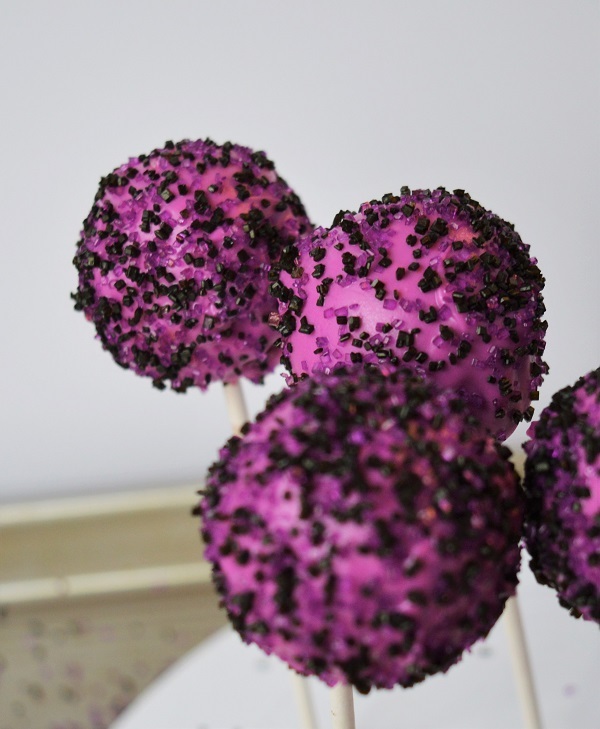 Today I want to share with you my Halloween inspired cake pops. I am no where near an expert with cake pops and am honestly glad they didn’t all fall off the sticks and just end up in my mouth. I made these ones by baking the cake in the actual round form. I have done them with cake crumbles + frosting, but found this to be a little easier to dip as the pops weren’t as heavy. Another bonus is not having to roll them all by hand. There are a few cons though, no extra flavor and moistness from the frosting and special equipment is needed. To each (method) their own. 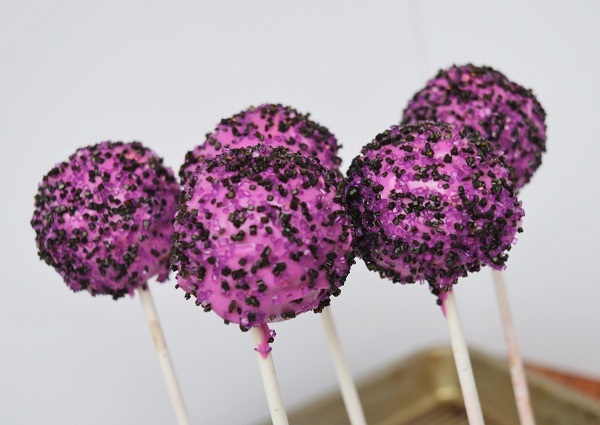 Bake cake pops according to directions included with pan and allow to cool. Make the chocolate the right consistency. You want it to be able to fall off a spoon in a slow steady stream, not globs, but not like pouring water out of a pitcher, but more like pancake batter. Sorry for all the analogies, but I find them to be helpful at times. If your chocolate is too thick thin with a little (1/2 tsp ish) oil, stir well and add more as needed. I do not measure these things I just go by look. For more specifics I recommend other sites dedicated to this sort of thing like Bakerella. Dip end of lollipop stick in a little chocolate and insert into cake pop, allow a few minutes to set. Dip pop into melted chocolate, remove pop in swirling motion to remove excess chocolate (youtube has excellent tutorials on this). Cover in sprinkles. You can either roll in a bowl full of sprinkles or drop them on by hand. I prefer the later method with a cookie sheet under my work area to ease in clean up. Let stand to dry. Some pans have little holes to place the pops in, if yours does not you can simply use a piece of styrofoam to hold them. Eat. Or share with friends and family!